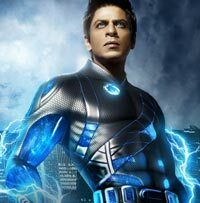 Rediff.com » Movies » Why Ra.One bashers need to SHUT UP! Why Ra.One bashers need to SHUT UP! I should add a disclaimer at the very beginning: I am a devoted fan of Shah Rukh Khan and therefore can't even pretend to be objective while reviewing any movie of his. I have been hopelessly and unapologetically in love with the man since I saw him, eons back, standing on one leg to woo the object of his affection in one of his Doordarshan serials. At that time, SRK was gangly and awkward and had a god-awful haircut. But I still thought he was smashing. My faith in him was further strengthened by the slew of borderline corny but hugely enjoyable movies he consistently delivered over the years -- Dilwale Dulhania Le Jayenge, Kuch Kuch Hota Hai, Kal Ho Naa Ho, Om Shanti Om and dozens of others. But, and I have to admit this, some of his movies have also been beyond forgiveness. I have cringed at his hyperbolic Bengali Babu act in Devdas. I have walked out of a screening of Mohabbatein because I couldn't stand his sweater-loving professor character spewing romantic gyan. I have stared in disbelief as he rescued an entire fake village from an equally fake hurricane in My Name is Khan. Yes, SRK is human and he too makes mistakes. But Ra.One is NOT one of them. After reading the reviews of many of my esteemed colleagues, all of whom trashed the movie mercilessly, I went for the movie with a sinking heart. My much-respected colleagues had a problem with Ra.One having too much of Shah Rukh Khan, of it being a manifestation of the superstar's mid-life crisis or of it allegedly caricaturing south Indians (!!!). "It is going to be a bad movie but I am a SRK fan and I will sit through it," I told myself. The plotline or premise of the movie has been repeated and analysed ad nauseam. And I agree with some of the reviews partly -- the first 20-30 minutes of the film, when SRK tries to act as the goofy Shekhar Subramaniam, falls flat on its face. But then, once Ra.One and G.One enter the scene, you have to strap yourselves in and get ready for the exhilarating ride. I don't think Ra.One has ever aspired to be anything other than an entertainer, and for the most part, it does entertain. Ra.One has superlative special effects, a stunning leading lady, several jaw-dropping action sequences, some genuinely quirky moments and a chillingly sinister villain. And of course, it has the leading man in several versions -- the blue-eyed superhero, the nerdy south Indian scientist and my personal favourite -- the Asian superhero who saves the damsel in distress. For years, Shah Rukh Khan has been heavily criticised for not stepping outside his comfort zone and sticking to his stock characters of Raj and Rahul. It has been said that SRK can only play SRK, the romantic hero with his arms wide open and twitching face. When he does dare to step out of his comfort zone, when he does try to experiment, when he does try to go where no other Indian actor has gone before, he is ripped apart for his efforts. And then his critics wonder why he chooses to do Karan Johar and Yash Raj type of films over and over again. We manage to forget our brains while watching a brawny superhero's burgeoning muscles tear off his shirt, in an unflattering ode to the Incredible Hulk. We blank out reason when another superhero (and a self-proclaimed intellectual one at that) bashes up ten goons double his size, suffering a memory loss right in the middle of the fight sequence. We do not puke while watching lesser superheroes act in regressive and raunchy comic capers where they act like oversexed buffoons. Why then do we go all holier than thou on SRK? Because he fails to deliver to (some of) our sky-high expectations? We never ask how Spiderman can climb buildings effortlessly or why Superman wears his underwear over his tights. They are Hollywood's superheroes and therefore venerable to us. But Ra.One and G.One fighting it out by throwing red and blue power rays at each other -- that we find juvenile! A superhero movie, by definition, defies logic and requires suspension of disbelief. In a world where almost nothing goes right, it reaffirms our belief that Good does trump over Evil. Shah Rukh Khan has never pretended to be an actor. He is here to entertain the masses and make money for himself. Nothing wrong with that! He could have taken the tried-and-tested route and done yet another goofy, romantic lover boy movie. That film would have raked in hundreds of crores at the box office, made a newer generation of women (and men) swoon over him and helped him buy yet another plush building in suburban Mumbai. But instead of taking a role he could have sleepwalked through, SRK decided to follow his dream of making India's first superhero film. It might be a flawed dream -- the Michael Jackson sequence, British thugs speaking in Hindi or G.One being lectured on Karva Chauth are of the so bad it's good variety -- but hats off to the man for trying. Ra. One is escapist entertainment at its finest. For those who wanted a more textured film with depth and insights, well, tough luck folks!